For other uses, see Gentleman (disambiguation). "Gentilhombre" redirects here. For the racehorse, see Gentilhombre (horse). "English Gentleman" redirects here. For the Sutherland book, see The English Gentleman. For the 2006 song, see An English Gentleman. 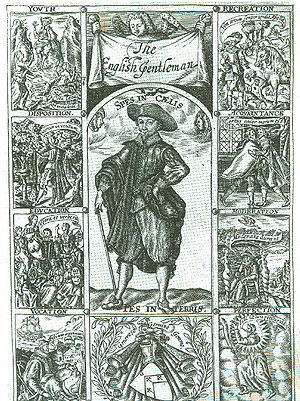 John Selden, in Titles of Honour (1614), discussing the title gentleman, likewise speaks of "our English use of it" as "convertible with nobilis" (an ambiguous word, "noble" meaning elevated either by rank or by personal qualities) and describes in connection with it the forms of ennobling in various European countries. These same ideas are discussed by Larence (1824). And in the Romance of the Rose (c. 1400) we find: "he is gentil bycause he doth as longeth to a gentilman." This use develops through the centuries until 1710, when we have Steele, in Tatler (No. 207), laying down that "the appellation of Gentleman is never to be affixed to a man's circumstances, but to his Behaviour in them," a limitation over-narrow even for the present day. In this connection, too, one may quote the old story, told by some—very improbably—of James II, of the monarch who replied to a lady petitioning him to make her son a gentleman, "I could make him a nobleman, but God Almighty could not make him a gentleman." Selden, however, in referring to similar stories "that no Charter can make a Gentleman, which is cited as out of the mouth of some great Princes that have said it," adds that "they without question understood Gentleman for Generosus in the antient sense, or as if it came from Genii/is in that sense, as Gentilis denotes one of a noble Family, or indeed for a Gentleman by birth." For "no creation could make a man of another blood than he is." The word gentleman, used in the wide sense where birth and circumstances are inconsequential, is necessarily incapable of strict definition. For "to behave like a gentleman" may mean little or much, according to the person by whom the phrase is used; "to spend money like a gentleman" may even be no great praise; but "to conduct a business like a gentleman" implies a high standard. Gentlemen whose ancestors are not known to come in with William duke of Normandy (for of the Saxon races yet remaining we now make none accompt, much less of the British issue) do take their beginning in England after this manner in our times. Who soever studieth the laws of the realm, who so abideth in the university, giving his mind to his book, or professeth physic and the liberal sciences, or beside his service in the room of a captain in the wars, or good counsel given at home, whereby his commonwealth is benefited, can live without manual labour, and thereto is able and will bear the port, charge and countenance of a gentleman, he shall for money have a coat and arms bestowed upon him by heralds (who in the charter of the same do of custom pretend antiquity and service) and thereunto being made so good cheap be called master, which is the title that men give to esquires and gentlemen, and reputed for a gentleman ever after. Which is so much the less to be disallowed of, for that the prince doth lose nothing by it, the gentleman being so much subject to taxes and public payments as is the yeoman or husbandman, which he likewise doth bear the gladlier for the saving of his reputation. Being called also to the wars (for with the government of the commonwealth he medleth little) what soever it cost him, he will both array and arm himself accordingly, and show the more manly courage, and all the tokens of the person which he representeth. No man hath hurt by it but himself, who peradventure will go in wider buskins than his legs will bear, or as our proverb saith, now and then bear a bigger sail than his boat is able to sustain. Petruchio: I swear I'll cuff you if you strike again. The fundamental idea of "gentry", symbolised in this grant of coat-armour, had come to be that of the essential superiority of the fighting man, and, as Selden points out (page 707), the fiction was usually maintained in the granting of arms "to an ennobled person though of the long Robe wherein he hath little use of them as they mean a shield." At the last, the wearing of a sword on all occasions was the outward and visible sign of a gentleman; the custom survives in the sword worn with court dress. 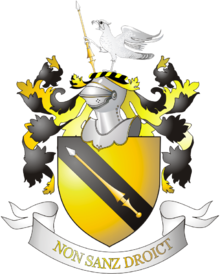 A suggestion that a gentleman must have a coat of arms was vigorously advanced by certain 19th- and 20th-century heraldists, notably Arthur Charles Fox-Davies in England and Thomas Innes of Learney in Scotland. The suggestion is discredited by an examination, in England, of the records of the High Court of Chivalry and, in Scotland, by a judgment of the Court of Session (per Lord Mackay in Maclean of Ardgour v. Maclean  SC 613 at 650). The significance of a right to a coat of arms was that it was definitive proof of the status of gentleman, but it recognised rather than conferred such a status, and the status could be and frequently was accepted without a right to a coat of arms. The opposite of the Jūnzǐ was the Xiǎorén (小人), literally "small person" or "petty person". Like the English small, the word in this context in Chinese can mean petty in mind and heart, narrowly self-interested, greedy, superficial, and materialistic. Lee's definition speaks only to conduct. The power which the strong have over the weak, the employer over the employed, the educated over the unlettered, the experienced over the confiding, even the clever over the silly—the forbearing or inoffensive use of all this power or authority, or a total abstinence from it when the case admits it, will show the gentleman in a plain light. The gentleman does not needlessly and unnecessarily remind an offender of a wrong he may have committed against him. He can not only forgive, he can forget; and he strives for that nobleness of self and mildness of character which impart sufficient strength to let the past be but the past. A true man of honor feels humbled himself when he cannot help humbling others. Lee's conception is one of the better known expositions in favor of the Southern culture of honor. That a distinct order of landed gentry existed in England very early has, indeed, been often assumed and is supported by weighty authorities. Thus, the late Professor Freeman (in Encyclopædia Britannica xvii. page 540 b, 9th edition) said: "Early in the 11th century the order of 'gentlemen' as a separate class seems to be forming as something new. By the time of the conquest of England the distinction seems to have been fully established." Stubbs (Const. Hist., ed. 1878, iii. 544, 548) takes the same view. Sir George Sitwell, however, has suggested that this opinion is based on a wrong conception of the conditions of medieval society and that it is wholly opposed to the documentary evidence. The most basic class distinctions in the Middle Ages were between the nobiles, i.e., the tenants in chivalry, such as earls, barons, knights, esquires, the free ignobiles such as the citizens and burgesses, and franklins, and the unfree peasantry including villeins and serfs. Even as late as 1400, the word gentleman still only had the descriptive sense of generosus and could not be used as denoting the title of a class. Yet after 1413, we find it increasingly so used, and the list of landowners in 1431, printed in Feudal Aids, contains, besides knights, esquires, yeomen and husbandmen (i.e. householders), a fair number who are classed as "gentilman". Sir George Sitwell gave a lucid, instructive and occasionally amusing explanation of this development. The immediate cause was the statute I Henry V. cap. v. of 1413, which laid down that in all original writs of action, personal appeals and indictments, in which process of outlawry lies, the "estate degree or mystery" of the defendant must be stated, as well as his present or former domicile. At this time, the Black Death (1349) had put the traditional social organization out of gear. Before that, the younger sons of the nobles had received their share of the farm stock, bought or hired land, and settled down as agriculturists in their native villages. Under the new conditions, this became increasingly impossible, and they were forced to seek their fortunes abroad in the French wars, or at home as hangers-on of the great nobles. These men, under the old system, had no definite status; but they were generosi, men of birth, and, being now forced to describe themselves, they disdained to be classed with franklins (now sinking in the social scale), still more with yeomen or husbandmen; they chose, therefore, to be described as "gentlemen". the premier gentleman of England, as the matter now stands, is "Robert Ercleswyke of Stafford, gentilman"... Fortunately—for the gentle reader will no doubt be anxious to follow in his footsteps—some particulars of his life may be gleaned from the public records. He was charged at the Staffordshire Assizes with housebreaking, wounding with intent to kill, and procuring the murder of one Thomas Page, who was cut to pieces while on his knees begging for his life. If any earlier claimant to the title of gentleman be discovered, Sir George Sitwell predicted that it will be within the same year (1414) and in connection with some similar disreputable proceedings. From these unpromising beginnings, the separate order of gentlemen evolved very slowly. The first gentleman commemorated on an existing monument was John Daundelyon of Margate (died circa 1445); the first gentleman to enter the House of Commons, hitherto composed mainly of "valets", was William Weston, "gentylman"; but even in the latter half of the 15th century, the order was not clearly established. As to the connection of gentilesse with the official grant or recognition of coat-armour, that is a profitable fiction invented and upheld by the heralds; for coat-armour was the badge assumed by gentlemen to distinguish them in battle, and many gentlemen of long descent never had occasion to assume it and never did. This fiction, however, had its effect, and by the 16th century, as has been already pointed out, the official view had become clearly established that gentlemen constituted a distinct social order and that the badge of this distinction was the heralds' recognition of the right to bear arms. However, some undoubtedly "gentle" families of long descent never obtained official rights to bear a coat of arms, the family of Strickland being an example, which caused some consternation when Lord Strickland applied to join the Order of Malta in 1926 and could prove no right to a coat of arms, although his direct male ancestor had carried the English royal banner of St. George at the Battle of Agincourt. The younger sons of noble families became apprentices in the cities, and there grew up a new aristocracy of trade. Merchants are still "citizens" to William Harrison; but he adds "they often change estate with gentlemen, as gentlemen do with them, by a mutual conversion of the one into the other." A frontier line between classes so indefinite could not be maintained in some societies such as England, where there was never a "nobiliary prefix" to stamp a person as a gentleman, as opposed to France or Germany. The process was hastened, moreover, by the corruption of the Heralds' College and by the ease with which coats of arms could be assumed without a shadow of claim, which tended to bring the science of heraldry into contempt. The prefix "de" attached to some English names is in no sense "nobiliary". In Latin documents de was the equivalent of the English "of", as de la for "at" (so de la Pole for "Atte Poole"; compare such names as "Attwood" or "Attwater"). In English this "of" disappeared during the 15th century: for example the grandson of Johannes de Stoke (John of Stoke) in a 14th-century document becomes "John Stoke". In modern times, under the influence of romanticism, the prefix "de" has been in some cases "revived" under a misconception, e.g. "de Trafford", "de Hoghton". Very rarely it is correctly retained as derived from a foreign place-name, e.g. "de Grey". The situation varies somewhat in Scotland, where the territorial designation still exists and its use is regulated by law. With the growth of trade and the Industrial Revolution from 1700 to 1900, the term widened to include men of the urban professional classes: lawyers, doctors and even merchants. By 1841 the rules of the new gentlemen's club at Ootacamund was to include: "...gentlemen of the Mercantile or other professions, moving in the ordinary circle of Indian society". In Thomas Hardy's Tess of the D'Urbervilles, Tess Durbeyfield's travails stem from her father's discovery that his family name was in fact inherited from an aristocratic D'Urberville ancestor. Her apparent distant cousin (and seducer) Alec D'Urberville proved to be a member of a nouveau-riche 19th-century family that had merely adopted the surname of Stoke-D'Urberville in the hope of sounding more distinguished. In Spain, e.g., Gentilhombre de la casa del príncipe, "gentleman of the house[hold] of the prince"
The word gentleman as an index of rank had already become of doubtful value before the great political and social changes of the 19th century gave to it a wider and essentially higher significance. The change is well illustrated in the definitions given in the successive editions of the Encyclopædia Britannica. In the 5th edition (1815), "a gentleman is one, who without any title, bears a coat of arms, or whose ancestors have been freemen." In the 7th edition (1845) it still implies a definite social status: "All above the rank of yeomen." In the 8th edition (1856), this is still its "most extended sense"; "in a more limited sense" it is defined in the same words as those quoted above from the 5th edition; but the writer adds, "By courtesy this title is generally accorded to all persons above the rank of common tradesmen when their manners are indicative of a certain amount of refinement and intelligence." The Reform Act 1832 did its work; the middle classes came into their own, and the word gentleman came in common use to signify not a distinction of blood, but a distinction of position, education and manners. By this usage, the test is no longer good birth or the right to bear arms, but the capacity to mingle on equal terms in good society. In its best use, moreover, gentleman involves a certain superior standard of conduct, due, to quote the 8th edition once more, to "that self-respect and intellectual refinement which manifest themselves in unrestrained yet delicate manners." The word gentle, originally implying a certain social status, had very early come to be associated with the standard of manners expected from that status. Thus, by a sort of punning process, the "gentleman" becomes a "gentle-man". In another sense, being a gentleman means treating others, especially women, in a respectful manner and not taking advantage or pushing others into doing things they don't wish to do. The exception, of course, is to push someone into something they need to do for their own good, such as a visit to the hospital, or pursuing a dream they have suppressed. In some cases, its meaning becomes twisted through misguided efforts to avoid offending anyone; a news report of a riot may refer to a "gentleman" trying to smash a window with a dustbin in order to loot a store. Similar use (notably between quotation marks or in an appropriate tone) may also be deliberate irony. Another relatively recent usage of gentleman is as a prefix to another term to imply that a man has sufficient wealth and free time to pursue an area of interest without depending on it for his livelihood. Examples include gentleman scientist, gentleman farmer, gentleman architect, and gentleman pirate. A very specific incarnation and possible origin of this practise existed until 1962 in cricket, where a man playing the game was a "gentleman cricketer" if he did not get a salary for taking part in the game. By tradition, such gentlemen were from the British gentry or aristocracy - as opposed to players, who were not. In the same way in horse racing a gentleman rider is an amateur jockey, racing horses in specific flat and hurdle races. The term gentleman is used in the United States' Uniform Code of Military Justice in a provision referring to "conduct befitting an officer and a gentleman." The use of the term "gentleman" is a central concept in many books of American Literature: Adrift in New York, by Horatio Alger; "Fraternity: A Romance of Inspiration, by Anonymous, with a tipped in Letter from J.P. Morgan, (1836); Gone with the Wind, by Margaret Mitchell (1936). It relates to education and manners, a certain code of conduct regarding women that has been incorporated in the U.S. into various civil rights laws and anti-sexual-harassment laws that define a code of conduct to be followed by law in the workplace. Scarlett O'Hara in Gone with the Wind, states "You're no gentleman" on occasions when a lack of manners and respect toward her causes her to feel insulted. ^ "definition of gentleman in English". Oxford Dictionaries. Retrieved 23 May 2017. ^ a b c d e f g Phillips 1911, p. 604. ^ Origins of the English Gentleman (Stroud, Tempus, 2002), p. 9. ^ footnote 3 of the John Ball (priest) for a list of references. ^ Selden, John (1614) [first published 1614]. Titles of Honour (1st ed.). London: William Stansby for Iohn Helme. Retrieved 2018-12-28. ^ "Definition of noble in English". Oxford Living Dictionaries. Oxford University Press. Retrieved January 27, 2019. ^ a b c d e f g h i j k l m Phillips 1911, p. 605. ^ Phillips 1911, pp. 604–605. ^ American Art: History and Culture, Wayne Craven, ISBN 0-07-141524-6. "Thomas Jefferson, Gentleman Architect"
This article incorporates text from a publication now in the public domain: Phillips, Walter Alison (1911). "Gentleman" . In Chisholm, Hugh. Encyclopædia Britannica. 11 (11th ed.). Cambridge University Press. pp. 604–606. Roetzel, Bernhard (2009). Gentleman: A Timeless Guide to Fashion (3rd ed.). Köln: h. f. Ullmann. ISBN 9780841608931. OCLC 501389868.